Well, the title of this update is a little misleading. What it refers to is the 100 consecutive hours that all of our servers were continuously running, without a crash, before we took them down today. The misleading bit is that they were actually up 113 hours before we took them down! 100 hours of glory just sounded better to me. What makes that number even more impressive is the build they were running. The current build is the first iteration of our new procedurally generated terrain system. Let that sink in. A barely-tested build with a brand new procedurally generated terrain system debuted, and not only didn’t it crash, it didn’t even come close to crashing, during a 4-day shakedown cruise. Heck, we all know what happened to those poor passengers on the S.S. Minnow on a 3-hour cruise, right? So, a great debut for a rather complicated and important system, and a big step forward for our game. This system will allow us to quickly create wide swathes of terrain, which can then be further tweaked to make them even better. We have promised you folks a large world, and with this system, we can deliver on that promise, without having to break the bank by hiring content people to build it. What you see today is not what you will get in Beta and beyond. We are not even in Version 1.0 of this system, yet. We haven’t even begun to build out the variety of the grasses, bushes, trees, etc., that make up the biomes that you will see in the game. The best way to think about what you will be seeing is that it is Version 0.1, not Version 1.0. This system is very scalable, based on a person’s hardware. You will not need the latest and greatest, over-the-top video card to play our game. OTOH, we do plan on making sure that our Backers with very powerful systems will be able to scale things up accordingly. This system allows us to create forests that look, feel, and act like forests. 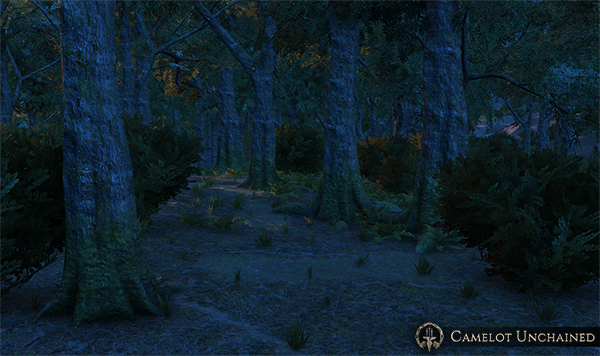 Even in V0.1, our forests are starting to resemble the kinds of forests that will be important for our game’s combatants and crafters alike. 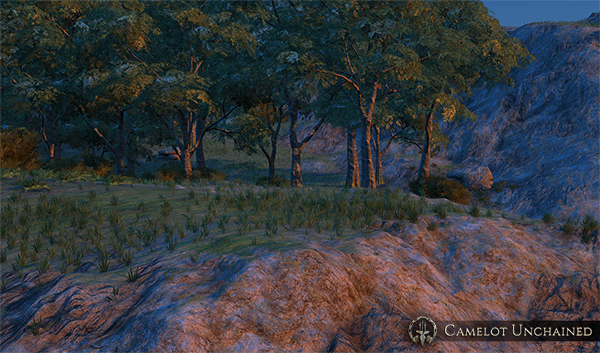 And there are not too many games, including MMORPGs, which have forests like ours will be. Everything you see in our game can be changed in real-time. The maps that you are playing on can be updated while you play, either through the changing conditions of lands (e.g. ownership by one Realm), a developer, or, a bit further down the road, by Veilstorms, spells, etc. How cool is that? While this feature has long been found in standalone games, very few true MMORPGs have been able to do what we can do today, let alone what we’ll be able to do further down the road. I’ve promised our Backers, even before you were Backers, that I wasn’t going to try to get people aboard the hype train. And while I have stayed away from the usual “Hear us ROAR!” stuff, this is a major piece of technical wizardry led by the hat-wearing sorcerer himself, Andrew Meggs. And if you like what you have seen, or will soon see (more on this later), know that it will get even better over the next few months. Last week saw some of the CSE crew attend Dragon Con down in Atlanta, Georgia. A great time was had by all, and the traveling road crew (myself, Andrew, Tyler, Michelle, Brian, and David) were on five panels all told, during the convention. Our own panel was a great success, and our Backers and potential future Backers were treated to about 10 minutes of video/live gaming, and a long Q&A. Posters were given out, gifts exchanged, and by the end of the show, the folks at Dragon Con and I were amicably chatting about what deviltry we could work towards for next year. In terms of that panel and videos, we are going to make them all available tomorrow or Friday, on our YouTube channel (https://www.youtube.com/user/CityStateGames). At 26G, it’s a big ‘un! Next week, we will have a very important Live Stream. The exact date is still TBD (probably Wednesday), but you will definitely want to check it out. I rarely say that our Live Streams are important (I like to think of them as fun), but this one, well, I think everybody will agree that it was a very important one. And no worries folks, it is a good one. Don’t worry about a safe falling on our heads, or CSE getting bought by an Evil Alliance, or something similar. It’s a good news, no bad news, sort of thing. We should have another User Story update at the end of the week. With the Labor Day Holiday and Dragon Con, it won’t be as chock-full of goodness as some of our other updates, but it is quality, not quantity, which matters, right? Or was that size? Also, we will have some very good news for our non-US Backers regarding our store. We will share this news with the Community in the coming weeks. When we reveal what we are doing, and how our European Backers in particular are affected by it, I know you folks across the pond will be very happy with our decisions. We’re sorry that things have taken longer than we would have liked, but sometimes, delays are worth it. In this case, I know our Backers outside the US will be quite happy with the results of the delay. 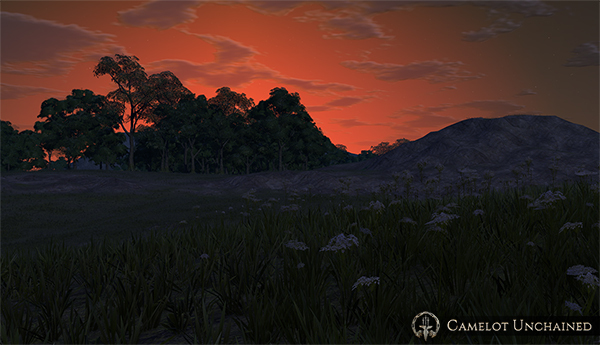 Next up, we recently launched the nearly-completed German version of our Camelot Unchained website (http://camelotunchained.com/de_v2). So, danke sehr to our German Backers, who made this happen! You folks did a great job on our site, and we greatly appreciate it. Special thanks go out to Tirudan and The Pendragon for their help with this final push. You really made this happen when we needed you to do it! FYI, we want to keep our non-US language sites updated and fresh as a spring day in the beautiful, rolling countryside of Virginia, so we are always looking for volunteers to help us out! So, more volunteers would be most welcome, anytime! While this isn’t a traditional update, we do have some fine artwork to share with you. First up is the latest model update from Jon. 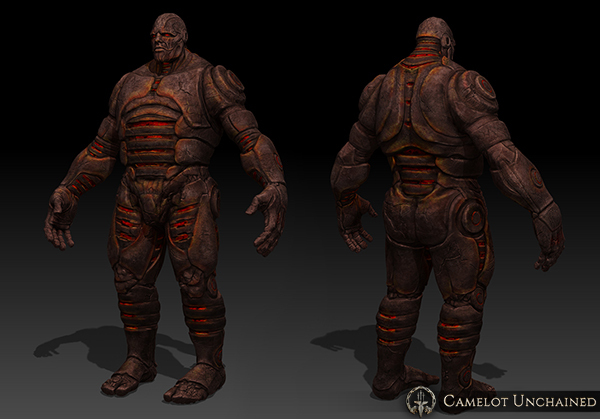 This time the Golem gets a bit of an overhaul. Like Jon’s other work, this guy is definitely a lot more badass than his predecessor. Next up are some screenshots from our game. The disclaimer of “no photo retouching, except for the watermark” applies, as usual. The first shot is at the edge of a forest. Now we have a shot from inside the forest. And the final shot captures the changing light at the outskirts of a stand of trees. Looks like a bit of an improvement over the terrain from our current video, right? And remember guys and gals, it only gets better from here.